Ea O Ka Aina: What would Sitting Bull do? 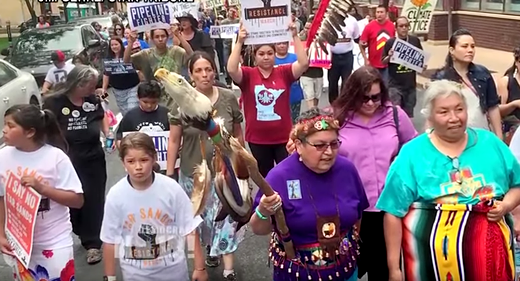 Image above: Standing Rock Sioux and others demonstrating against the Dakota access Pipeline. Still frame from video below. Every major pipeline project in North America must cross indigenous lands, Indian Country. That is a problem. The road west of Fargo is rarely taken. In fact, most Americans just fly over North Dakota, never seeing it. My head clears as I drive. My destination is the homeland of the Hunkpapa Oceti, Standing Rock Reservation. It is early evening, the moon full. If you close your eyes, you can remember the 50 million buffalo—the single largest migratory herd in the world. The pounding of their hooves would vibrate the Earth, make the grass grow. There were once 250 species of grass. Today the buffalo are gone, replaced by 28 million cattle, which require grain, water, and hay. Many of the fields are now in a single GMO crop, full of so many pesticides that the monarch butterflies are dying off. But in my memory, the old world remains. If you drive long enough, you come to the Missouri River. Called Mnisose, a great swirling river, by the Lakota, she is a force to be reckoned with. She is breathtaking. “The Missouri River has a fixed place in the history and mythology” of the Lakota and other Indigenous nations of the Northern Plains, author Dakota Goodhouse would explain. In the time before Sitting Bull, the Missouri River was the epicenter of northern agriculture, the river bed so fertile. The territory was known as the fertile crescent of North America. That was then, before the treaties that reduced the Lakota land base. But the Missouri remained in the treaty—the last treaty of 1868 used the Missouri as a boundary. Then came the theft of land by the U.S. government, and the taking of the Black Hills in 1877, in part as retaliation against Sitting Bull’s victory at the Battle of the Little Big Horn. In a time prior to Black Lives Matter or Native Lives Matter, great leaders like Sitting Bull and Crazy Horse were assassinated at the hands of police. One truth: the Lakota people have survived much. Forced into the reservation life, the Lakota attempted to stabilize their society, until the dams came. The 1944 Pick Sloan project flooded out the Missouri River tribes, taking the best bottom lands from the Mandan, Hidatsa, and Arikara, the Lakota and Dakota. Over 200,000 acres on the Standing Rock and Cheyenne River reservations in South Dakota were flooded by the Oahe Dam itself, forcing not only relocation, but a loss of the Lakota world. The Garrison, Oahe, and Fort Randall dams created a reservoir that eliminated 90 percent of timber and 75 percent of wildlife on the reservations. That is how a people are made poor. Today, well over two thirds of the population of Standing Rock is below the poverty level—and the land and Mother River are what remains, a constant, for the people. That is what is threatened today. Enbridge and partners are preparing to drill through the riverbed. The pipeline has been permitted in sections from the west and from the east. The northern portion was moved away from the water supply of Bismarck, into the watershed of Standing Rock. That was unfortunate for the Lakota. Despite Lakota legal and regulatory objections, the Dakota Access Pipeline construction began in May 2016. If finished it will snake through North and South Dakota, Iowa, and Illinois, where it will link to a 774-mile pipeline to Nederland, Texas. More than 570,000 barrels of Bakken crude oil will pass through the pipeline daily, along with 245,100 metric tons of carbon daily—enough carbon to combust the planet to oblivion. In late July, the Standing Rock Sioux Tribe represented by Earthjustice, filed a lawsuit in the United States District Court for the District of Columbia against the U.S. Army Corps of Engineers. Standing Rock claims the project violates federal and treaty law. Standing Rock also filed an intervention at the United Nations, in coordination with the International Indian Treaty Council. “The Environmental Protection Agency, the Department of the Interior and the National Advisory Council on Historic Preservation supported more protection of the tribe’s cultural heritage, but the Corps of Engineers and Energy Transfer Partners turned a blind eye to our rights. The first draft of the company’s assessment of the planned route through our treaty and ancestral lands did not even mention our tribe. The Dakota Access pipeline was fast-tracked from Day 1 using the Nationwide Permit No. 12 process, which grants exemption from environmental reviews required by the Clean Water Act and the National Environmental Policy Act by treating the pipeline as a series of small construction sites. The health of the Missouri River has been taken for granted. Dammed in the Pick Sloan Dam projects, each project increases contamination and reduces her health. Today, the Missouri is the seventh most polluted river in the country. Agricultural run-off and now fracking have contaminated the river. My sister fished a gar out of the river, a giant prehistoric fish, only to find it covered with tumors. Here’s just one case: In a January 2015 spill, saltwater contamination from a massive pipeline spill reached the Missouri River. In the baffling way of state and federal agencies, North Dakota’s Health Director David Glatt did not expect harm to wildlife or drinking water supplies because the water was diluted. The saying is: “The solution to pollution is dilution.” That is convenient, but not true. Blacktail Creek and the Little Muddy River were contaminated after nearly 3 million gallons of saltwater with elevated levels of chloride contamination. All was diluted. But then there was that gar fish with the tumors. There are pipelines everywhere, and fewer than 150 Pipeline Hazardous Materials Safety Administration (PHMSA) pipeline inspectors in the whole country. And now comes the risk from oil. At Standing Rock, as the number of protesters grew from 200 to 2000, state law enforcement decided to put up a safety checkpoint and rerouted traffic on Highway 1806 from Bismarck to Standing Rock, hoping to dissuade people from coming and put the squeeze on Standing Rock’s Prairie Knights Casino, which is served by that road. We just drove around; the scenic route is beautiful. And as supporters surge in numbers, the casino hotel and restaurants are full. “I am here to advise anyone that will listen that the Dakota Access Pipeline project is harmful. It will not be just harmful to my people but its intent and construction will harm the water in the Missouri River, which is one of the cleanest and safest river tributaries left in the Unit States. To poison the water is to poison the substance of life. In the meantime, North Dakota Gov. Dalrymple announced a state of emergency, making additional state resources available “to manage public safety risks associated with the ongoing protest of the Dakota Access Pipeline.” He may have exceeded his scope of authority and violated civil and human rights to water. There are a lot of people at Standing Rock today who remember their history and the long standoff at Wounded Knee in 1973. In fact, some of those in Standing Rock today were there in 1973 at Wounded Knee, a similar battle for dignity and the future of a nation. I am not sure how badly North Dakota wants this pipeline. If there is to be a battle over the pipeline, it will be here. For a people with nothing else but a land and a river, I would not bet against them. Video above: Interview with Winona LaDuke on Democracy Now! on Enbridge Corporation pipeline through Standing Rock Sioux territory. From (https://youtu.be/kooD44norew).